Using the expertise and input of Olympic gold medalists Brad Schumacher and Wolf Wigo, Adolph Kiefer & Associates has designed a full-featured Shot Clock System for water polo. Kiefer's durable and easy-to-use system includes a fully wireless RF system, preventing cables from cluttering your deck or storage spaces. It's made with a lightweight and durable molded polyethylene body for easy transportation and durability. Its ultra-bright 7-inch red LED displays and oversized alarm clearly signal clock violations. In addition, Kiefer's system features a Smart Charge battery-operated system and an easy-to-use robust control console to program and operate the system. New CareWipes LCD Wipes protect you and your LCD screens from sweat, grime and germs. CareWipes LCD Wipes are pre-moistened wipes with a special formula that cleans valuable fitness equipment LCD screens effectively and safely. These wipes eliminate destructive moisture exposure that can occur with spray cleaners. Use on any LCD/Plasma screen or monitor in your fitness facility. Quantum Fitness has introduced a compactly designed elliptical, the Quantum 210C for commercial use. With a 44-inch footprint, the elliptical maintains a full 21-inch stride for the most effective workout and is designed to occupy minimal space, ideal for gym owners. The Quantum 210C features a low 7-inch step height with cushioned foot pedals to reduce fatigue. The design of the upper-body arms is configured to accommodate the widest range of users and reduce wrist stress. It uses an advanced mid-drive technology to promote core stability and balance to add to a smooth and enjoyable workout. 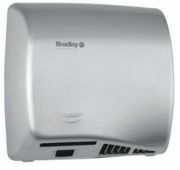 The new AerixTM hand dryer from Bradley is an adjustable speed hand dryer to suit any application. Multiple speeds give facility managers the option of turning up for fast drying in settings such as sports centers, schools or theme parks. Aerix series hand dryers are a green solution, using 80 percent less electricity than other popular hand dryers. In addition, several Aerix models conform to the ADA anti-protrusion requirement. The streamlined dryers are available in several color options, including cast iron, white enamel-coated steel or stainless steel with a satin finish. Hands-free operation or push-button-operated models are offered. Aerix hand dryers are easy to install, even during renovation, and feature vandal-resistant front covers. SeaKlear®Spa is now offering Alkalinity Up, a specially formulated compound used to increase the total alkalinity in spa and hot tub water, helping to prevent the corrosion of metals and etching of surfaces. SeaKlear®Spa Alkalinity Up eliminates pH "bounce" and maintains pH at the proper level. This product helps to prevent corrosion and equipment damage, effectively raises total alkalinity and helps keep pH stable. SourceOne's Plugr Tow Pro is a 45-inch self-contained attachment with a universal mount for operation behind virtually any utility vehicle. Plugrs are reciprocating aerators with tines driven deep by an independent engine. An electric-start 12-hp engine powers aeration, and a 12-volt battery runs the control panel. Independent power allows mowing and aeration without dragging down mower power. Tow Pro has offset capability to maneuver close to obstacles with a tow vehicle wider than the aerator. The control panel features single-switch tine disengagement to skip over sprinkler heads without stopping and a transport switch to increase ground clearance for loading. Providing an innovative and environmentally friendly solution, Daktronics now offers a solar power option for scoreboards where electrical service is impractical. In certain cases, scoreboards fitted with solar panels are more cost-effective than trenching power from remote power grids. The solar power kit includes two 40-watt solar panels, a control box and batteries. 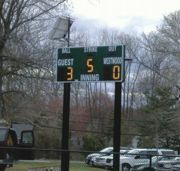 Upon installation, the scoreboard is ready for use with an operating time of 20 hours with full sun power or 15 hours without sunshine. Although it takes five days to completely recharge a dead battery, the display still runs for 3.5 hours every day, ensuring reliable usage for consecutive game days. Acu-Trol, a division of Pentair Water Commercial Pool & Aquatics, now offers a new Automated Air Quality Management (AAQM) system, which provides continuous monitoring of the combined chlorine levels of indoor pool environments—to eliminate chlorine odor, eye and skin irritation. The system automatically monitors combined chlorine levels and communicates directly with the building's air handling unit, allowing it to vary the amount of new air brought into the building. The system provides facilities with improved indoor air quality, reduces health concerns and the "intelligent air turnover" reduces energy costs by replacing only the air needed.